This card was made for a young man who loves dogs. I started with the kraft base embossed it, then rubbed espresso ink directly onto it, decided it was too dark, so rubbed some Ink Gold Gold paste over that again to brighten it up. I found the image of a fox terrier at the Graphics Fairy, sized him to what I wanted, and then framed him with a Polaroid die cut frame, the edges of which I swiped with Ink Gold Gold Paste. The greeting was a freebie at Birds Cards - it was trimmed and the swiped with the gold paste before adhering it. The final detail was some washi tape over the plain area at the top of the card where the embossing folder did not reach, and I punched in two eyelets and threaded some coarse twine through them. The sentiment was stamped and white embossed on a maroon scrap, and the edges were also white embossed. The patterned paper in the background is another scrap from my 'promise box', and was originally wrapping paper - it was a tad narrow for the card, so I used a snippet of lace to 'extend' it. Although totally different to the original card, I am equally happy with it. Princess Judy (Palmer) of Blog This. I encourage you to visit her as she does wonderful work, and writes her blog with great humour!! Way back in mid-December I saw a post by Yoonsun Hur using the Single Rose Die by Simon Says, and fell in love with it, and did a spur of the moment purchase. i had to wait for it to arrive, but it was worth it. I 'CASED' Yoonsun's card from memory - making the water coloured background using some Kohinoor water colours, sprayed it with silver shimmer mist and die cut the rose and leaves out of it. I then cut some scraps of the same weight water colour paper with the roses, and some green card with the leaves, and placed them back into the die cuts, with the red background cut outs too. I embossed the sentiment with white ep at the base of the card, and added a wee silver bow and sequins to finish the card. I was inspired to pull out the pearl-ex powders by Autumn at Sew Paper Paint, and to stamp and emboss onto vellum by Suchi at Suchi's Cardstock. Both techniques I have not used in a while. Suchi coloured her stamping on vellum, but I ended up not doing that, other than on the body of the moth. I started by stamping a panel with the silk moth image (a now discontinued stamp) in Versamark, and then brushed pink pearl-ex over it. To seal the colour onto the card I gave it a quick spray of hair spray - it worked a treat. I started using the other side of this paper, but when I turned it over I decided to use this side with it's softer colours and subtle images. The sentiment was stamped and white embossed on a snippet of the same card as the base, and cut into a banner - this was mounted over some loosely looped gold thread, and raised with some foam dots in the centre. This is a close up of the silk moth image - I coloured the body with a dark brown marker on the back of the vellum, and then adhered the fussy cut image with some foam dots under the coloured body. A few rhinestones finished the card. I have had this gorgeous All Dressed Up image coloured and ready to go on my desk for ages, and decided to use it on this card for a two year old. I cut the image with a S/B Labels 11, embossed it, then coloured the debossed line with a prismacolor pencil - fussy, but it was worth it, I feel. I cannot recall which pencils I used to colour the image. I added clear Kindy Glitz to the top of the skirt and the bow. and the 'birthday' at the base. 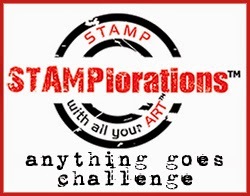 The stamps are a clear set that I received in Blog Candy from the lovely Barb, but they had no brand name on them. A few (carefully placed) random sequins finished the card after mounting the image over the layer of lace. I wanted a card for an elderly friend who is having some health issues, and this is what eventuated. I stamped and gold embossed this gorgeous rose, now discontinued, and sat and coloured it whilst watching a (50 over) cricket match. I coloured it with prismacolor pencils and some other very cheap pencils for the orange colour. To add a little sparkle, I painted some WoS over the petals and leaves. I mounted the fussy cut rose over some dark patterned paper (from the Kaiser craft Botanicals pad) after embossing the sentiment on it (a Rubbabubadoo stamp), mounted that onto an orange base and added a few sequins. When needing a birthday card recently I spied this last piece of my stamped base board. This time I had added birds and bees to the initial butterflies and flowers, again colouring them with chalks to match the original work. I chose to use a purple base for the card, as it picked up the colours in the butterfly wings and the edge of the flower petals. I sprayed the base with a silver shimmer mist, and although it does not show in the photos, I added some stickles to the bee's wings. I layered three ribbons down one side of the card, starting with a pink adhesive ribbon, then a pale mauve sheer topped by a very narrow purple one. Then this flower from my 'promise box' wanted to be used, so I sprayed that with the silver mist and added it. The sentiment was silver embossed onto a snippet of purple which was cut into a banner shape by hand and edged with a silver pen. When it was adhered I added some foam dots under it to give a wee bit of dimension. I have another CAS card to share today - this one is not my usual size, as I trimmed the base to fit the stitched rectangle die I used to cut the water - colour paper. The focus of the card started with a water coloured patch for a background, some silver punch waste and the one of the birds from the STAMPlorations Small Birds stamps, which I silver embossed and water coloured. 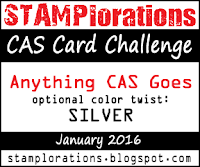 I had fun making this CAS card. I started with a piece of white linen textured card, and stenciled one of the butterflies from the STAMPlorations Flutterby stencil using Victorian Velvet and Worn Lipstick Distress inks. The sentiment from the STAMPlorations Noteworthy set was stamped in Victorian Velvet. It did not stamp well, as I sometimes find with Distress Inks, so I touched it up with a fine paintbrush loaded with the ink. The final details were to splatter the background with both inks, and add some sequins, and mount the panel over a bright pink base. I wanted to make a feminine thank you card, and this is the result. I sorted through the NBUS file and found this stamp from Indigo Blue, Peony Posey (which appears to have been discontinued). I went to place it on a acrylic block, and my largest was not large enough... then I thought of a hint I read somewhere ages ago - use a Cuttlebug plate - it worked a treat.!! I coloured the image with chalks, and added gold ink dots to the centre of the blue flowers - forget-me-nots? The stamp was so large that it was really all I needed to make the card - other than the embossed Thanks and a doodled edge. I needed a card for a friend who moved from being a 'city girl' onto a farm, so decided that would be the theme in this card! I started by die cutting the opposing corners with a die from the Memory Box Distress Baptista Collage Set, and adhered gold paper behind them. The sentiment is from Layers of Color (now defunct) stamped in Memento Cottage Ivy ink. The image is also from Layers of Color, stamped with Memento Tuxedo Black ink and coloured with Prismacolor pencils. All comments are moderated and spam rejected. This is a quick review of last year - simply my choice of one card from each month. It's taken me a while to get organised, but here it is. I hope you enjoy it, and if you want to visit the original post, simply click on the title. I hope you have enjoyed my selection - it was not easy to narrow down from 125 cards to just 12. I would love to know which one would be your favourite.